Luis Roman, of Dorchester, works in BMC’s radiology department. 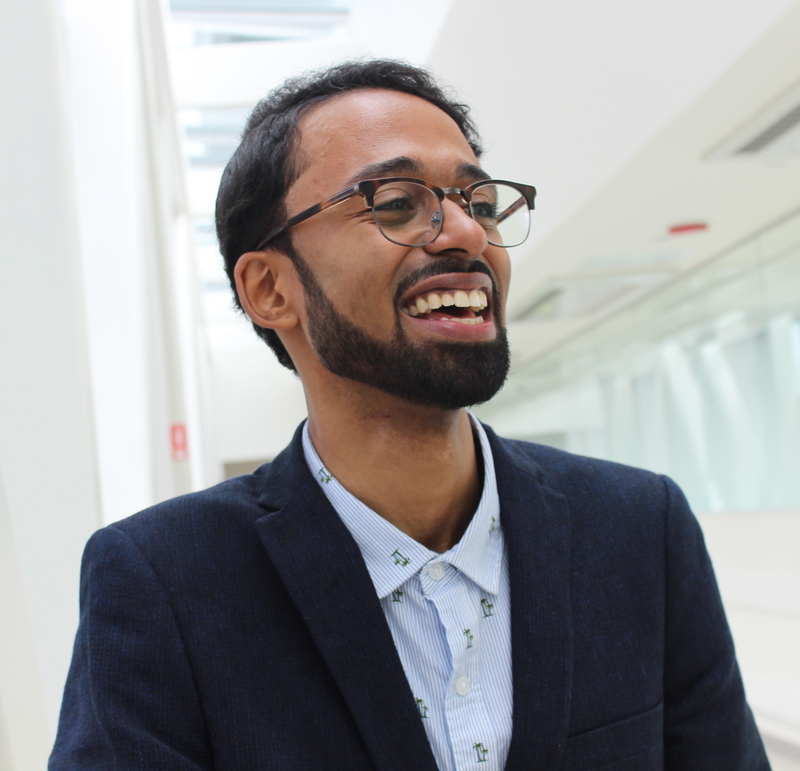 When Luis Roman thinks of why he likes his job, he thinks of a recent day when he was manning the Patient Access Services desk in Boston Medical Center’s radiology department. On this particular day, he saw a woman in a wheelchair coming off the elevator. She was nudging herself backwards bit by bit with her feet. At a glance, she may have looked like someone improvising her way in a wheelchair but Luis could see the Herculean effort she was exerting. He jumped up from his station to ask the woman if he could help. She thanked him profusely. “God bless you,” she said, overcome by the small act of kindness. When Boston Medical Center (BMC) thinks of its hiring strategy, it thinks of employees like Luis – people who are talented, passionate, and members of the communities they serve. In early 2018 when the City of Boston launched BostonHires, a hiring campaign to promote the benefits of hiring Boston residents in quality jobs, Boston Medical Center was one of the first hospitals to sign up. As a BostonHires Champion, BMC pledges to hire Boston residents in living wage jobs, ensuring that half this total is also offered benefits. In the first six months of the campaign, BMC hired more than 400 Boston residents into living wage jobs; all employees working over 20 hours per week are able to earn benefits as well. This includes employees like Luis. So how does an organization like BMC prioritize hiring Boston residents into well-paying jobs, while still keeping an eye on the bottom line? Busayo Ola Ajayi thinks about this question daily in her role as BMC’s Director of Talent Acquisition and Diversity and Inclusion. For one, she says, there is considerable overlap between BMC employees and patients: 67% of BMC staff receive their healthcare at the hospital. 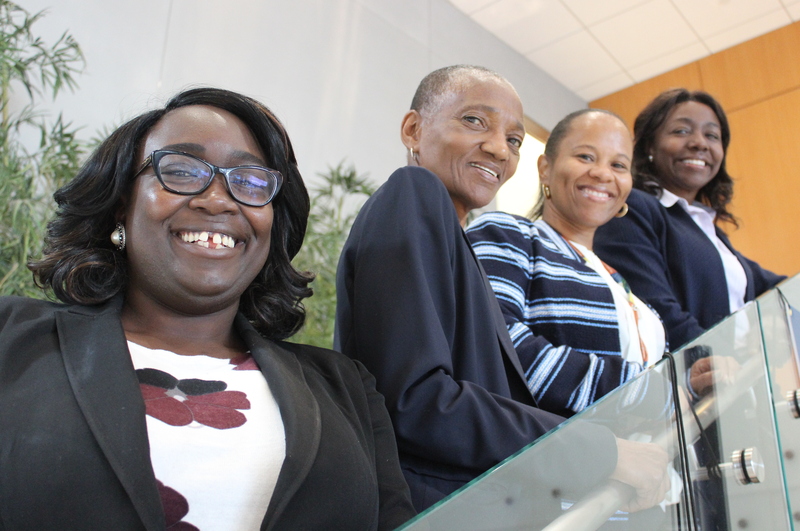 Busayo Ola Ajayi (foreground) with L to R: Dr. Thea James, associate professor of emergency medicine and director of BMC’s Violence Intervention Advocacy Program; Varda Halidy, associate director of diversity and talent acquisition; Lisa Kelly-Croswell, chief human resources officer. Equally important is that BMC staff reflect the urban population they are serving and striving – per the hospital’s vision – to make the healthiest in the world. Among BMC’s patients, 57% are from under-served populations and 32% do not speak English as a primary language. They are also racially diverse, as Boston is a majority-minority city. Ajayi experienced this reality first-hand when she was admitted as a BMC patient herself. While she waited for her mother to arrive from Africa, one of the hospital’s nurses noticed that Ajayi was Nigerian – and she was as well. BMC’s investment in a diverse and well-paid workforce pays off for the hospital, too. Luis Roman is interested in taking advantage of BMC’s tuition reimbursement program to start college coursework and ultimately enter the ultra-sound field. The human resources team at Boston Medical Center works together to recruit a diverse workforce.